glossier perfectly timed their latest release, the supers. i always take my skincare up a notch for fall and winter–the cold air can really do a number on my skin! i've been using kiehl's midnight recovery concentrate for a few years as a nighttime serum (which i love, and absolutely recommend! ), but was looking to change things up. 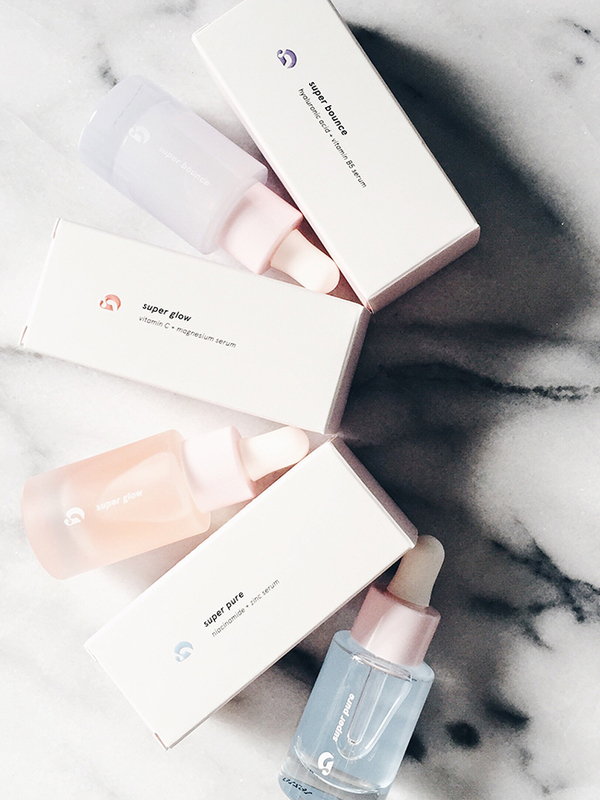 when i saw that glossier was releasing a collection of serums, i needed to get my hands on all three of 'em! i've been testing them out for a few weeks, and although it can take much longer to notice a difference in the appearance/texture of your skin, i'm totally in love with two out of the three serums. you can read more of my thoughts below! i've become a huge fan of hyaluronic acid this year. it hydrates my skin like nothing else and leaves it plump and moisturized! the texture of super bounce is so silky smooth, and like the other serums, it's fragrance-free which i really like. i use 2 drops every morning and pat it into my skin before applying my moisturizer. i've been using this serum once a day for a few weeks and can definitely feel a difference in the texture of my skin. dubbed the brightening serum, super glow helps to reduce dark spots and create smoother, more energized skin. this serum is another favorite as i've been using it every night on my cheeks to help fade some dark marks left behind from breakouts. similar to super bounce, i use 2 drops and pat it into my skin (fyi–i find 2 drops supplies me with more than enough product for each application!). i feel like i noticed a change in the appearance of my skin immediately after i started using super glow. it's nice to wake up with glowing, happy skin! made to treat irritated and acne-prone skin, super pure is the serum i was most excited about, but i'm not sold on it yet. both of the vitamins found in this serum help to decrease redness and calm breakouts. i've been using it on my forehead and chin every night, but haven't noticed much of a difference in my skin just yet. i'm not writing off this serum yet, just need to give it more time to see if it can work! even if super pure doesn't work out, loving two of the three serums is pretty good if you ask me! has anyone else given the supers a try? which is your favorite?